ProtonMedia: Doors are open! Tour life sciences' first Virtual Diabetes Institute. Doors are open! Tour life sciences' first Virtual Diabetes Institute. I have some great news to share with you today. We've been working with medical education provider SciMed over the past several months on a major project to hit life sciences and continuing medical education (CME). It's been a labor of love, and our teams are excited to pull the curtains off and share our innovation with you! We've created the industry's first Virtual Diabetes Institute. It's an innovative learning environment made in ProtoSphere. It gives primary-care physicians a more realistic, engaging, and collaborative way to participate in CME-certified activities for improving the management of patients with Type 2 diabetes. We have a press release coming out soon announcing the project. It's packed with a lot of details on what we've created, how and why physicians are using it, and our long-term vision for the project. I'll post the press release on our blog once it's out, so I won't let all of the cat out of the bag just yet. What I will show you right now, though, are some screen shots of the Virtual Diabetes Institute. I'm bubbling to talk about it so I had to blog these! 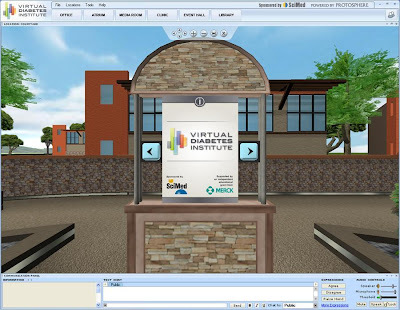 Flip through to take a tour of SciMed's Virtual Diabetes Institute.